Stop feeling frustrated and overwhelmed by your business technology! CPU Solutions can help to improve efficiency, productivity and growth in your bottom line! Don't let a computer problem shut down your entire operation. Our techs respond quickly to your requests and can resolve issues by logging into your system remotely or by visiting your location in-person. CPU Solutions partners with businesses that lack a true IT department or are in need of supplemental IT. Trust our 20+ years of experience to deliver bulletproof solutions that keep your operation running smoothly. In today's day and age, any company could be the next target of a data breach. Don't risk the negative publicity and legal ramifications - call us today for a free Data Security Analysis. We've supported many specialized systems that allow businesses to run smoothly. From Point of Sale systems to Inventory Management, we have the experience needed to keep things moving. Are the computers at your office slow or not working the way that they should? Considering major technology upgrades for your company? Call (401) 885-4261 or click the button below to get your FREE technology review! Mandy at CPU Solution keeps all our computer systems operating properly. When we have a computer problem, she always responds quickly and gets everything running correctly. She either remotes into our system or comes to our location, if necessary. The response time is great and the fees are very reasonable. The outcome is always perfect. We highly recommend CPU Solution. I have been doing business with CPU Solutions for over 10 years and the company has been using them for 20 years. Mandy at CPU Solutions provides the utmost in customer service and technical assistance. With any computer crisis, Mandy provides almost immediate assistance be it on site visit or remotely. They are technologically savvy, educated, polite, and stress customer care and assistance. I truly have not met a company who provides such excellent care of their customer’s because without our computers, we do not operate. Mandy makes that happen. Mandy is very prompt in returning calls and usually will come onsite (if needed) the same day. She has set some systems up so that she can even fix problems remotely. We depend on her to trouble-shoot and to keep our systems secure and up-to-date. She is knowledgable, honest and is great at multi-tasking when onsite. CPU Solutions is our trusted partner and have our utmost confidence in their knowledge, work ethic, honesty and dependability. They are our single source for servers, desktops, laptops and enterprise level software. Not only do they provide the equipment we use, they are also our “go to” resource in resolving any number of possible problems: software installation, configuration issues, backups/restoring data, security concerns, and the installation and maintenance of our interlocking LANs. Always fixes my IT problems as quickly as possible. Really knows exactly what it going on with any IT issue that presents itself. For close to 17 years RI Temps, Inc. has relied on CPU Solutions for all of our IT needs. Mandy and Peter are just wonderful to work with, they take all the guess work and headaches away. They have amazing knowledge and have always helped us save money and keep our infrastructure safe and running smoothly, not to mention that are easy to reach and quick to respond, even when it’s the little things. We appreciate them and look forward to many more years of GREAT SERVICE!! For over 20 years, CPU Solutions has been providing technical consulting and solutions to businesses in Rhode Island and southeastern Massachusetts. 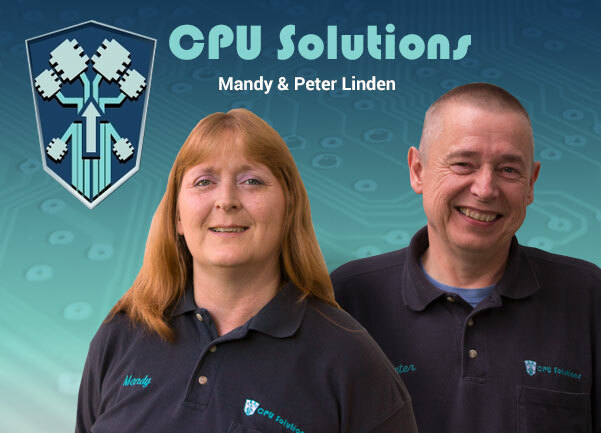 Founded in 1996 by Mandy and Peter Linden, CPU Solutions is a Certified Woman Owned Small Business (MBE / WBE) that brings together expertise in hardware / software with a keen understanding of customer service. When combined, CPU Solutions is able to offer a well rounded bundle of computer repair and IT consulting services that leverage the latest technology to solve your problems, big and small. Clients love the fact that we're able to quickly diagnose and solve problems and help them understand the work that we're doing by speaking in plain terms. In the end, you'll find our approach logical and easily understood, while your business benefits from increased efficiency and productivity. Over the last 20 years we've built strong relationships with companies that don't have internal IT staff, solving the issues that they encounter day to day. We also act as supplemental IT for larger companies that have in-house IT teams, but need help with specialized software or hardware upgrades that require more manpower. In either case, our customers think of us as being an essential part of their IT teams! We are a Microsoft Certified Partner and continue to educate ourselves on emerging technology. It's our job to stay ahead of the curve and identify technology that can solve problems and help your business run more efficiently. Have a question about our computer repair and IT consulting services? Call or use the form below to send us an email. Please try to be as detailed as possible so we can provide you with the proper information when replying. All required fields are marked with an asterisk (*).